Jesus Is Great, Super And Wonderful! 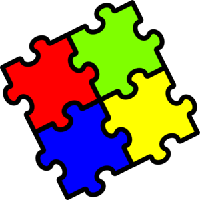 Jigsaw is the Sunday School held at St Katherine's Church on the first and third Sunday of each month. After sharing in the start of the main worship with their family and friends, children will be invited to listen to a bible story, based on the week's Gospel reading, followed by some messy craft activities and prayer time. They will then rejoin the congregation for the peace and final parts of the service. Children must be accompanied to church by an adult but will be supervised during the Jigsaw workshop to ensure accompanying adults can also enjoy the service and sharing in worship.